Although President Obama's foreign policy missteps have made Europe much less safe than it was eight years ago, European elites have overlooked Obama's mistakes because he is a "globalist" who seems to favor recreating the U.S. in the European image. Trump, by contrast, is a nationalist who wants to rebuild the U.S. in the American, not the European, image. European anti-Americanism is certain to escalate in the years ahead, not because of Trump or his policies, but because "globalists" appear desperate to save the failing European Union, an untransparent, unaccountable, anti-democratic, sovereignty-grabbing alternative to the nation state. Europe's media establishment has greeted Donald Trump's election victory with a vitriol not seen since the George W. Bush presidency, when anti-Americanism in Europe was at fever pitch. European elites have been mostly silent about Obama's foreign policy failures, but are now lashing out at Trump for pledging to restore order by "making America great again." "We now face emptiness — fear of the void. What will happen to the West, to Europe, to Germany without the United States as its leading power? In Germany, Der Spiegel, one of the largest-circulation publications in Europe, published a cover, after Donald Trump's election victory, with an image of a giant meteor in the shape of Trump's head hurtling towards the earth. The headline reads: "The End of the World (As We Know It)". "It really happened. He did it. Donald Trump proved all experts wrong.... A man who... preaches hate and snubs America's most important partners will run the most powerful country on Earth. It is a political catastrophe. "The world, and America, is now threatened by a dangerous phase of instability: Donald Trump wants to make America 'great' again. If one believes his pronouncements, he will proceed ruthlessly: He wants to throw 11 million migrants out of the country, renegotiate all major trade agreements and make important allies such as Germany pay for US military protection. That will trigger significant conflict, incite new rivalries and spur new crises." "In other words, 60 million Americans acted stupidly. They cast their votes for xenophobia, racism and nationalism, the end of equal rights and social conscience, for the end of climate treaties and health insurance. Sixty million people followed a demagogue who will do little for them. "Those who have lived in New York or experienced dinner conversations in Georgetown and debates at Harvard University's Kennedy School of Government, know how brilliantly intelligent and worldly Americans can be.... Once you get outside such circles, such cosmopolitan thinking isn't nearly as widespread." "The man who politicians around the world called 'scary,' 'ignorant' or 'irrational' will move into the White House. The uncertainty around the world is great. If cartoonists are to be believed, Donald Trump's idea of ? ?the world is very simplistic. Africa is the birthplace of Barack Obama. Russia is a country that was made great again. Great Britain is a no-go area." "Wow. The West crumbles before our eyes. What is going on here can be explained by two data points: On November 9, 1989, the wall fell in Berlin.... On November 9, 2016, exactly 27 years later, a man has been elected to the White House whose central election pledge was the construction of a wall. "The ideas of the new president are neither contradictory nor confused. His demands can be easily summarized on the cap of a beer bottle: integrate Putin, keep Mexicans out and treat American allies as the customers of a security service. There is only protection if one pays cash, even in NATO. "Donald Trump is a remnant of a dying America.... He has turned the country from a multicultural lighthouse into an isolated island of white people who are afraid of their own shadow. "The idea of American exceptionalism, the lighthouse, was already present at the foundation of the nation.... The idea of ? ?American radiance is one with the ideas of the Enlightenment that came from Europe to the colonies. Ideas like universal values ? ?or the human striving for truth. "Trump's election means the end of this project. The United States is no longer a lighthouse, but a flaming fire of tired shadows armed to the teeth. No trace remains of its prototypical character, its imitability. It is defiant, closed to the world. The nationalism of isolationism... the tumultuous tribalism... are shaking the foundations of the Enlightenment. "The US upheld the values ? ?of the Enlightenment — humanism, an optimistic image of man, human dignity and civil rights — when Europe deviated from them in the thirties. It used humanism as a weapon in the struggle against fascism, its universality as a counterpart to nationalism, and with its re-importation after the Second World War has contributed to the reestablishment of the European project. Today, these values ? ?are once more in trouble in Europe, but the view across the Atlantic will not be reassuring as of January." Other German headlines include: "Trump has the Charisma of a Drunken Elephant," "Donald Trump: A Horror Clown as a Security Risk," "Trump: How Could this Happen?," "Plans of the New US President: How Trump Wants to Poison the Air," "Donald Trump: A Blow to Open Society," "America Chooses the Great Divider," "Donald Trump: A King Without a Plan," "Donald is not Ronald," "Donald is not Churchill," "Can Trump also Happen in Germany?," "How to Prevent a German Trump," "Who Can Stop Trump Now?," and "Will Berlin Have to Pay More for Defense?" "For Donald Trump, politics — like business — is about deal making. He thinks man-to-man talk with dictators can instantly dissolve problems, and approaches foreign affairs as zero sum game in which making America great can mean demeaning its traditional friends. His election makes the world a more dangerous place and also a more uncertain place, for it is too early to say precisely how those dangers will materialize — or how the next US president will face up to them." "Trumpism is, by nature, an authoritarian movement that regards democratic norms as dispensable if they fail to serve political ends. 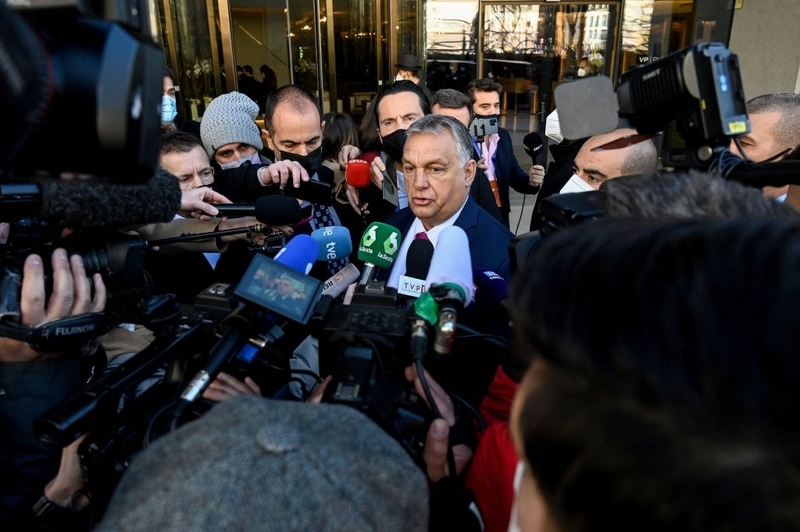 The aspiration — whether realizable or not — is clear: authoritarian societies such as Putin's Russia, Erdo?an's Turkey and Orbán's Hungary that maintain certain democratic trappings as a convenient front. "If the American people simply accept the legitimacy of this president, and they normalize this would-be tyrant, it will only embolden him.... Civil disobedience should be employed where necessary. Don't just do it for yourself, America. The fate of the rest of the world will be determined by your choices." Other British headlines include: "Will Donald Trump Destroy America?," "Why President Donald Trump is an Even Bigger Disaster than You Thought," "Donald Trump's Victory is a Disaster for Liberal Values," "Donald Trump's Victory is a Disaster for Modern Masculinity," "Privacy Experts Fear Donald Trump Running Global Surveillance Network," "Terrifying Trump Will Turn into Tamed Trump? It's an Illusion," "The Magnetic Pull of Trump, King Narcissist," "Will Donald Trump Make School Lunches Unhealthy? Doctors Warn the President-elect's Penchant for Burgers and Fried Chicken Could Hit Meal Trays," "In the Age of Trump, Why Bother Teaching Students to Argue Logically?," and "Donald Trump Believed to be Direct Descendant of Rurik the Viking who Established Russian State." "The victory of Trump represents a rebellion against reason and decency. It is the triumph of racism, or misogyny, or stupidity — or all three things at once. It is the expression of the poor judgment and bad taste of 60 million Americans, the vast majority of them men and women of white skin who own homes, cars, firearms and eat more than citizens of any other country on earth. "This is where you see with perfect clarity the stupidity, frivolity and irresponsibility of those who voted for Trump. For all of Clinton's defects, they are trivial compared to those of Trump, whose ignorance, zero principles and zero experience in governance are joined by all forms of personal vices that every person in their right mind at any latitude of the world considers deplorable. "I know the kind who voted for Trump. I met them when I made reports in Texas, Montana, Arizona, Oklahoma, Alabama and other typically Republican states. They tend to be kind, religious and honest people, decent in their reduced social orbit. But after sitting down to talk with them for a while I always reacted with the same perplexity: how is it possible that we speak the same language? Their words are familiar to me but their brain circuits operate differently. They are people of simple faith, oblivious to the irony; people who choose their truths not based on facts but on their beliefs or prejudices; people who live far from the ocean and the rest of planet Earth, of which they are afraid. I've never experienced a similar sense of disconnection in Europe, Africa or Latin America. Just inside the United States." In Austria, Kronen Zeitung published a headline entitled, "Nuclear Suitcase: In 72 Days Trump Could Annihilate Civilization." Also in Austria, Kurier published a story entitled, "Trump Victory: Boon for Suicide Hotlines." In France, the newspaper Libération featured a cover with Trump and the words "American Psycho." Another headline read: "United States: The Empire of the Worst." L'Obs asked, "With Trump, the Beginning of De-Globalization?" Le Figaro wrote: "Donald Trump: From Clown to President," and "Europe Paralyzed by the Trump Shock." Le Monde wrote, "Donald Trump's Victory: A Brexit for America." In the Netherlands, Telegraaf declared, "Trump is a Nightmare for Europe." Although President Obama's foreign policy missteps, especially those in the Middle East, have made Europe much less safe than it was eight years ago, European elites have overlooked Obama's mistakes because he is a "globalist" who seems to favor recreating the United States in the European image. Trump, by contrast, is a nationalist who wants to rebuild the United States in the American, not the European, image. In the past, European federalists have tried to make anti-Americanism the basis of a new pan-European identity. This artificial post-modern European "citizenship," which demands allegiance to a faceless bureaucratic superstate based in Brussels, has been presented as a globalist alternative to the nationalism of the United States. In essence, to be "European" means to not be American. As the European Union comes apart at the seams, Europe's political establishment can be expected to try to exploit anti-Americanism in a desperate attempt to use it as a glue to hold a fractured Europe together. Commenting on Trump's victory, Dutch Parliamentarian Geert Wilders, wrote: "America has just liberated itself from political correctness. The American people expressed their desire to remain a free and democratic people. Now it is time for Europe. We can and will do the same!"